Do you want to become a nurse? And earn your bachelor’s degree? Now you can — in just three years! The Pomeroy College of Nursing at Crouse Hospital has partnered with Le Moyne College to create an accelerated nursing program called Degree in 3. The first of its kind in Central New York, the program provides students with dual matriculation at both Pomeroy and Le Moyne colleges, culminating upon completion in an associate in applied science with a major in nursing from Pomeroy and a bachelor of science with a major in nursing from Le Moyne. The program will begin in the fall of 2019. The program provides the best of both worlds: an on-campus experience and extensive clinical practice. All financial aid and tuition payments will be coordinated through Le Moyne, including a variety of federal and state aid, student loans, scholarships and awards. Completing the degree in just three versus four years is not just less expensive overall, but you will be in the professional workforce that much quicker. 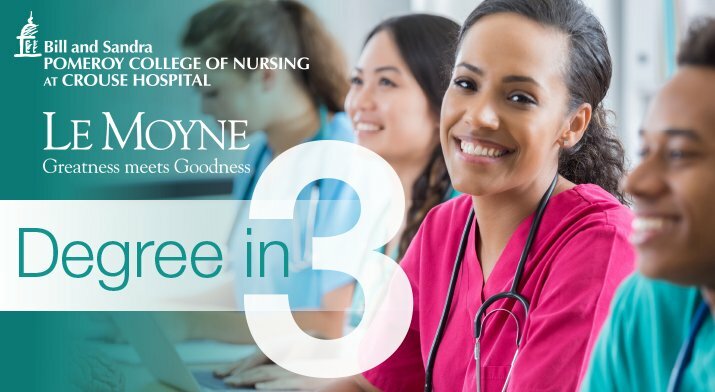 To apply to the new Le Moyne/Pomeroy three-year degree program, contact Le Moyne College at admission@lemoyne.edu or call 315-445-4300, or contact Amy Graham, assistant dean for enrollment at the Pomeroy College of Nursing, at 315-470-7481 or email amygraham@crouse.org.